The last 20 years have changed football more dramatically than any time period in the history of the sport. The ridiculous amount of money in the sport has resulted into the game becoming almost unrecognisable from when I first fell in love with it. Players can be sold for over 50 million and nobody bats an eye, people fanatically support clubs from places they’ve never been and Manchester City are quite good – truly we are living in the future. It made me think – what will football be like in another 20 years’ time? Here’s the story of the 2035/36 season so you can find out. Borussia Dortmund fans turn up for the first game of the season brimming with excitement and optimism, having finally ended Bayern Munich’s streak of 15 titles in a row in the previous campaign. The first fans to arrive at the stadium are confused to find that it no longer seems to be there, with a giant crater where Westfalenstadion used to be. It emerges that Bayern have bought the entire squad, as well as the stadium, tea ladies and Twitter followers. BVB are forced to forfeit every single game due to being unable to field a team. They still do better in the Champions League than Arsenal. After performing well in the league and winning the Sky Sports Cup last season, Liverpool are hopeful that they will finally win their 19th title. These hopes are sent even higher when Steven Gerrard Jr. scores two goals on his debut at home to Red Bull Newcastle. Unfortunately for Liverpool fans, this excellent performance means he is promptly sold to a team in the Chinese Second Division for 500 million Euros, a figure which enrages the majority of supporters who believe they should have got at least another 200 for him. The fans stage a walkout after 500 minutes of the next home game, nobody thinking to mention that this involves staying for almost 7 hours after full time. After sacking their 14th manager since Alex Ferguson departed the club, Manchester United announce the new boss will be…Alex Ferguson. Not deterred by the fact he died five years ago, the clubs technical staff proudly inform the world they have been able to upload his brain into a laptop. United trail 2 – 1 going into the final minutes their first European Super League game with Ferguson back in charge, but end up winning 3 – 2 after the digital stadium clock is mysteriously altered. Ferguson denies allegations of hacking, switching himself off when the reporter from the BBC asks a question. On the other side of the city Vincent Kompany makes his 58th return from injury thanks to two bionic knees he had installed over the summer break. They malfunction while he jumps for a header, sending him into the air and into orbit. Club PR plays this off as the captain being so loyal he wanted to see if the moon really was blue. Qualifying for Euro 2036 concludes with the playoff round, with a number of anxious nations waiting to see which of them will be able to attempt to stop Wales from winning their 4th trophy in a row. Scotland look set to finally make it back to a tournament after drawing the Faroe Isles, but the Tartan Army is to be disappointed, with the Faroe Isles triumphing 3 – 2 on aggregate. 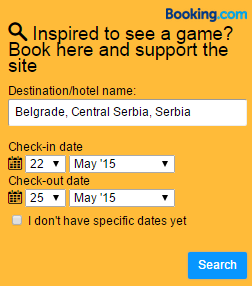 Police leave for the whole of Europe is cancelled after Serbia draw Kosovo in another of the playoff fixtures. Serbia win 1 – 0 with a goal in the 119th minute, the ball deflecting into the net off one of the numerous drones that flies over the pitch for the entire game. The final team qualifying for the tournament (which had controversially been awarded to Somalia) is the Czech Republic, who cruise to victory against Sweden after manager Zlatan Ibrahimovic decides to name himself at every position for the second leg. Meanwhile back in England, a Sunderland fan receives a lifetime banning order after being searched on entry to the Emirates Stadium and being found not to be in possession of an iPad. With the January transfer window looming, the players who have performed well so far over the course of the season race to enrol themselves in Mandarin lessons. They are joined by England manager Jamie Vardy, who has vowed to finally learn to speak English. The two-time Ballon d’Or winner promptly drops out to become manager of Magaluf Rovers, toasting the news with a 2012 vintage WKD Blue. Meanwhile, Juventus fans protest the clubs decision to play their third string players in Serie A so they can focus on the European Super League – a policy which means they are just 10 points clear at the top of the table going into the new year. The transfer record is broken by RB Beijing, who become the first club to sign a player for 1 billion Euros. They also break the record for highest ever wages paid to an individual player, offering over a million a week to some guy they saw on YouTube kicking a bottle into a bin while blindfolded. During Sky Sports News 24/7 coverage of the window this signing is widely praised, noting that this would really help the club gain social media followers. Meanwhile Tottenham Hotspur go 35 points clear at the top of the league, leading some fans to claim they have an ok chance at finally winning the title. This is seen as foolish and wildly unrealistic. The annual ‘International Super Sunday’ is held by the Premier League. Manchester United and Liverpool play in front of 100,000 in Qatar, Arsenal are beaten 3 – 0 by Chelsea in Singapore, while West Brom and QPR draw 0 – 0 in Bangor. The FA praises clubs for thinking of their season ticket holders by streaming the games online for just £20. Combined with the 3am kick-off times, very few people are able to watch their team in action. Barry from Stoke sets off a flare in his garden after his team take the lead in Kuala Lumpur, and is promptly given a five year banning order. Atletico Madrid protest about not being included in the draw despite having won in the previous round, but UEFA informs them that their unpopularity on Reddit means they aren’t good for the brand and Manchester United will take their place instead. Diego Simeone receives a 3,000 match touchline ban after hiring an open top bus to parade the severed head of the president of UEFA. Meanwhile, FIFA elects a surprise new president, with Vladimir Putin taking 103% of the vote. The delegates roll down the windows of their suspiciously new looking Ferrari’s to defend their choices to the media. In the Netherlands, Feyenoord seem set to lift the title for the first time since 1999 after going 30 points clear with just two games to go. However, hopes of glory are dashed in Rotterdam when the KNVB inforce the little known ‘really cool name’ rule, awarding 50 bonus points to Go Ahead Eagles, meaning the title will instead go to Deventer. Arsenal fans celebrate wildly after it is confirmed they will finish in 4th place, until it is pointed out that the group stage of the European Super League only has four teams in it. The resulting Arsenal Fan TV video causes the entire internet to go down for several hours, with the resulting damage to the global economy more than worth it to see glum grown men who call themselves ‘The Boominator’ yell at each other. Tottenham Hotspur travel to Sunderland on the last day of the season, needing just a point to win the title. They lose 57 – 1, as the Black Cats make up the 56 goal swing they needed to avoid relegation. It is revealed that a few lucky punters had made bets on this happening, with odds as high as 2/1. This means Manchester City are crowned champions, while Swansea City celebrate wildly upon lifting the ‘highest pass accuracy statistics’ trophy, made of gold and in the shape of a giant heat-map, for the third time. I’m pretty superstitious when it comes to football. At Andorra away I accidentally stole the hotel keycard, and because Wales won I kept it with me for the rest of the campaign, all the way to qualification. Now our success probably has more to do with Gareth Bale and Aaron Ramsey than my accidental thievery, but who knows. I certainly still blame myself for Austria Salzburg losing the playoff final 5 – 2 a couple of years ago after forgetting to pack my lucky pants. So with this belief in meaningless symbolism, I was pretty pleased when I checked the time after arriving at Rotterdam Centraal to see it was 19:08. As any ‘echte Rotterdammer’ will be able to tell you, Feyenoord were founded in 1908, and the year features on much of the most popular merchandise sold both officially and unofficially. To be honest, we needed all the luck we could get. After a superb start to the season which saw local hero Dirk Kuyt return, arch rivals Ajax defeated for the first time in years and the prospect of finally mounting a real title challenge, it all went spectacularly wrong. Feyenoord lost 3 – 1 to NEC, a disastrous result. Then they lost to PSV. Then they lost again. And again, and again…a total of seven times consecutively in the league, utterly destroying the challenge for the title. Indeed, there was a danger of Feyenoord dropping out of the top half of the table, an unthinkable outcome for a season which promised so much. Understandably, furious supporters turned on the board and recent matches have seen a number of justified protests against Eric Gudde and co. Several hundred supporters were arrested at a game a couple of weeks ago during a non-violent march, which the police were quite clearly tipped off about by the board themselves. Fines of just over €200 were given out, a noticeable sum for anyone, but especially when you consider that many of the protestors were of student age. If I had been asked for €200 as a student, after emptying my bank account I would have asked the police were they expected me to get the remaining €196 from. Despite the troubled times, the stadium was, like always, completely sold out. Feyenoord could play a friendly match at 8am on a Tuesday against a team of 11 traffic cones and it would still be sold out. Also the way things are going, if it was a league game we’d lose 0 – 2. Still, there has been one bright spot for Feyenoord this season in the KNVB Beker, the top knockout competition in the Netherlands. 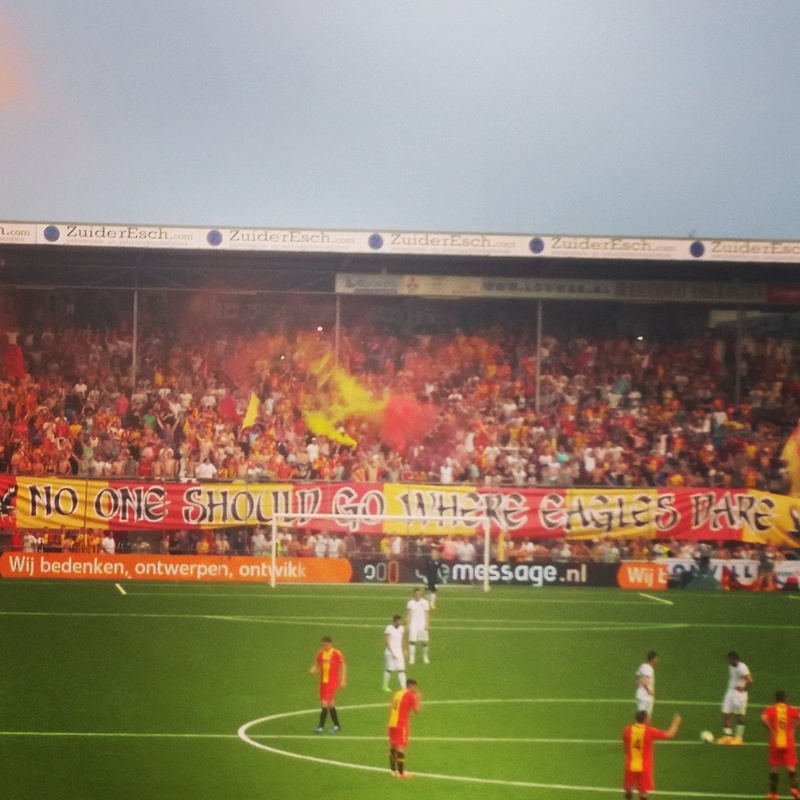 After an easy 3 – 0 victory over PEC Zwolle in the opening round, it’s been drama all the way. First there was the 94th minute winner over Ajax, then goals in the 88th and 119th minute to beat Willem II, followed up by another extra time win away at Roda JC. That series of wins set up the home semi-final against AZ. With PSV and Ajax both already eliminated, there was a real chance to end the eight year wait for a trophy. There is really something special about a night game at De Kuip, something which has been sorely missing this season due to the failure to qualify for the Europa League. There was a buzz in the air around the stadium that you only get with knockout football, and the atmosphere had already kicked off long before the game did. 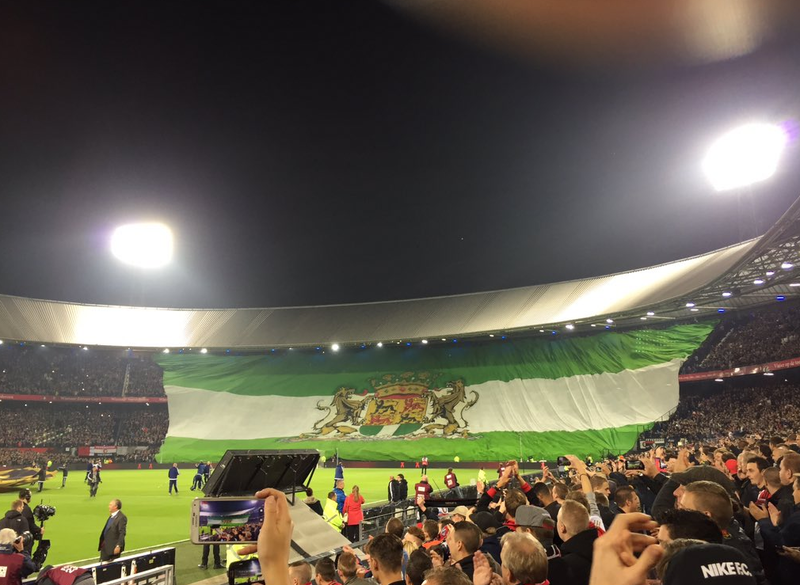 There was also a nice tifo, not quite on the spectacular level of Sevilla last season or Ajax earlier in this one, but a two card display first of all turned the stadium green and white (the colours of Rotterdam) and then switched to the red and white colours of the home shirt. With one of the best atmospheres of the season, Feyenoord made a fast start – almost finding the net within a couple of minutes. The AZ fans were also contributing, using some pyro in the away end and making a display of their own with red and white scarves. There were some nice chances to open the scoring in the opening ten minutes, with Feyenoord coming the closest to making it 1 – 0, but unable to get the shot on target from a promising position. Despite the frantic early pace, it would be the 12th minute where the game really game to life. It is traditional for atmosphere actions to take place during this minute of big games (and quite a few small games also), and the stand behind the goal Feyenoord were attacking did not disappoint, putting on a huge pyro show. Sparklers, flares, bangers and smokebombs lit up the night, it was the kind of display that is only fitting of such a beautiful stadium. Smoke drifted across the pitch in the aftermath, a reminder to the players of how much it meant to the supporters. 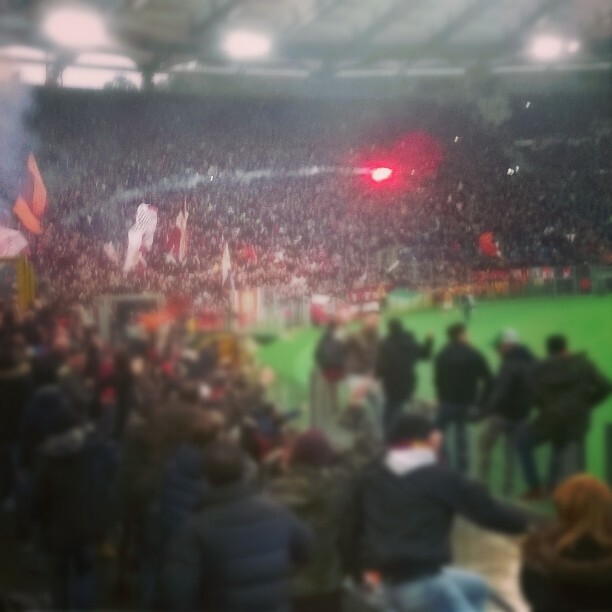 With the supporters having just set the stadium alight, it would soon be the turn of the players. Just moments after the last flare had spluttered out, the ball is crossed across the face of the goal, reaching Kramer who steered the ball into the net with the help of a touch from an AZ defender. It had been quite a while since De Kuip had seen such a mad celebration, with the now familiar surge towards the front of the stand and bodies tumbling to the ground. The way to judge how important the goal that Feyenoord just scored is by how many people are suddenly lying on the floor, and how many minutes it takes to get back to the people you were standing with before it went in. There was a new flag I hadn’t seen before on show which read (in English) ‘Many years of hurt never stopped us dreaming’ with a picture of the Beker and league trophies next to it. Well, De Kuip was certainly dreaming now, and while there wasn’t any emotional hurt at this time, there were plenty of shins that were certainly feeling the aftermath of the goal – it’s just not a Thursday night at Feyenoord without a couple of new bruises to add to the collection. AZ threatened to be blown away following this goal, with the atmosphere in full battle mode and the players playing with the kind of relaxed freedom that had been sorely missing as long ago as November. It was very nearly 2 – 0 just a few minutes later, and a string of four corners in a row wasn’t quite able to find a way past the sturdy Alkmaar defence. It could easily have been 3 – 0 at half time, but it remained just a single goal lead. It was a very pleasing performance in the first 45 minutes, but with this team you always feel as though one goal is not going to be enough to win a game, and I was sure we would come to regret the missed chances later on. Guess which of these banners I liked best? As the second half kicked off I thought “Right, just keep a clean sheet for 45 minutes and we’re in the cup final, I’m sure we can do…” and it was 1 – 1. Needing to hang on for 45 minutes without conceding, absolutely senseless defending meant that the home side didn’t even make it 45 seconds. Goalkeeper Vermeer hasn’t been a popular figure (no surprise, considering he was signed from Ajax), but he wasn’t really to blame here, his defence leaving him with no real chance of keeping the ball out of the net. He kept out the initial shot, but was left helpless as the follow-up was smashed in to equalise from less than a yard out. After so much good work in the first half, it was all undone instantly in the second. The away end had a mad moment of their own, one AZ supporter actually climbed up the fence at the front and stood on it to celebrate. Not that impressive, unless you know that the away end at De Kuip is in the top-tier and he was probably a good 30 – 40 feet in the air. The confidence crumbled out of Feyenoord in the way you would expect from a team that had won one league game since mid-December. AZ were now well on top, and really should have taken the lead. This lead to a number of chants being directed at the board “Gudde rot op, Gudde rot op, Gudde Gudde, Gudde rot op!” being the most popular. If you don’t understand Dutch, let’s just say that we wanted him to please go away. A defeat here and the season would realistically be over on the 3rd of March. AZ hit the post when it seemed easier to score, and an attacker went around Vermeer but didn’t have the right angle to get the ball into the net. De Kuip had the sense of impending doom, much in the same way it did after Zorya Luhansk made it 3 – 2 in the now famous Europa League playoff. You just knew they would score again to make it 3 – 3, and indeed they had done so. Of course that night had had the happiest of endings in the 94th minute, but it didn’t look very likely that this vital game would finish in a way to leave a smile on the faces of the Rotterdam public. I felt certain that AZ would score, and even if they didn’t, the prospect of extra time meant I would have missed my last direct train home, meaning I wouldn’t get home until 3am. Annoying when you’ve won, enough to make you take up following netball instead if you’ve lost. With just over ten minutes to go, Feyenoord make a rare break forward. Kramer has the ball in the box, but his strike at goal isn’t clean. The goalkeeper is able to touch it into the air, but only causing it to loop into the air and into the back of the net. Carnage in De Kuip. I don’t quite beat my personal record of falling down 15 rows after the second goal against Sevilla last season, but it’s close enough. There are bodies absolutely everywhere, at least 20 people needing to be picked up in the aftermath, both the noise and the amount of people tumbling to the ground resembling an earthquake. Like the banner said, the Feyenoord dream is one which never died and while this is not the league title which is so badly craved – it is still a very significant trophy and the stadium was in full party mode. “Komen wij uit Rotterdam?” “Ken je dat niet horen dan? !” was sung back and forth between huge sections of the stadium. “Feyenoord til I die…” was the next song to be bellowed out by the entire stadium, and this would prove to be a fitting choice. Ron Vlaar, now of AZ, spent six years with Feyenoord in the early days of his career, captaining the club for a few of these years. He was a very popular player during this time, in particular for the time he grabbed a microphone after a victory against Ajax and started the chants from the field. Clearly ‘Feyenord til I die’ had not been forgotten by Vlaar, and his foul on Elia gave away a penalty with four minutes to go. Local hero Dirk Kuyt stepped up, and there was never any doubt where the ball was going. He blasted it into the net, and now the party could well and truly get started safely. “Finale, ohooo, finale, ohooo!” and a chant directed at the major of Rotterdam joined the song rotation now, Aboutaleb is not a popular figure with Feyenoord supporters due to his excessive policing of matches, and “Hey Aboutaleb, Feyenoord is coming for you!” was chanted (as a joke rather than a threat, I should add) and the stadium was alive and jumping once more. After the months of hardship which had been endured, the frustrations and emotions all came tumbling out at once. “A carnival of love” was the slogan I saw all over Cologne, written on stickers slapped all over lampposts and metro stations, as well as being graffiti’d on a number of walls. If there was plenty of love to be found at the carnival, there certainly wasn’t any on show at the stadium, despite the game falling on the weekend of Valentine’s Day. 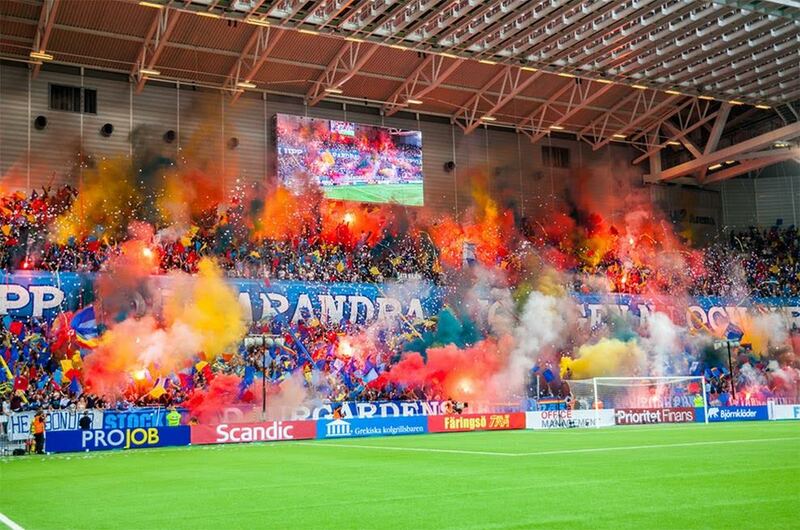 While this isn’t the main rivalry for either of these clubs, there is certainly a great deal of bad feeling between them due to the close proximity of the cities and previous incidents between both sets of ultras. I had visited an Eintracht Frankfurt home game once before, with the great atmosphere inspiring me to try out their away end. Having wanted to visit RheinEnergieStadion for quite a while and Cologne being just two hours away by train, it was the perfect opportunity. 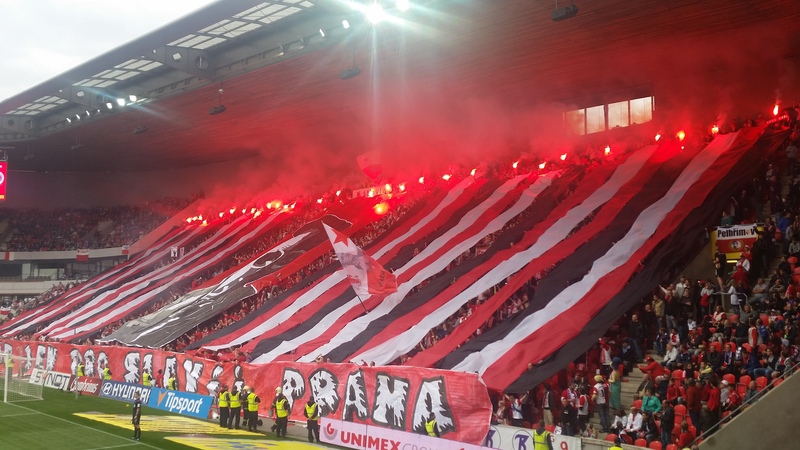 Eintracht Frankfurt supporters had grabbed the attention of the whole of Europe a few years ago during a Europa League campaign that was fairly good on the pitch, and an absolute triumph in the stands, with spectacular tifos and huge travelling support to the away matches. I have been hoping to see the club return to Europe ever since so I could take in a game, but this season they are sadly close to suffering the agony of relegation rather than the euphoria of European qualification. They went in to this game just one spot above the relegation playoff position, and there had been furious scenes at the end of a recent 0-1 home defeat to Darmstadt. The ultras had confronted the players at the end of that game, with many of them jumping a wall to stand on the edge of the pitch. It was called a pitch invasion by the DFB (more on them later), but in reality it was just anger at another poor performance – only three or four supporters stepping foot on the pitch, and even that wasn’t for long. A reader of the website from Frankfurt was able to get me a ticket in the standing section of the away end, and I was all set to experience what the SGE had to offer away from home. I didn’t realise when arranging the trip that it was also the 68th anniversary of the formation of FC Kôln, meaning they were sure to have something planned to celebrate. Sure enough, there were clear signs of a tifo (known as a choreo in Germany) when I took my first look at the stadium an hour before kick off. It’s a truly excellent stadium, and hard to believe that it was hosting second tier football until just recently. Regular readers will know that I like floodlights in the same way that some people like art, and these were some of the best I have seen so far on my travels, rising high into the sky like a tower designed to defend a castle. The away end was wisely situated at the furthest point from the home terrace, providing a great view of the outstanding choreo display that had been designed by the home supporters to celebrate the founding of their club. It began by displaying 13.02.1948 across the top tier, before a huge banner bearing the club’s logo was unfurled, along with a huge 1948 in the top tier, a banner talking about the honour of tradition of the club in the second, and a sea of waving red and white scarves. As the grand finale, each of the banners which displayed a number was dropped to reveal a great moment from the history of the club, starting in black and white and moving to colour as the years progressed. Finally, the last one read ‘one day…’ and mocked up FC Koln being pulled out of the hat at the Champions League draw. There would also be action from the away stand, with most of the away end holding up spray painted scarves with ‘SCHEISS DFB” written on them, and others with “NUR FUR DE SGE”, SGE being one of the names that Eintracht supporters use to refer to the club. There was also a banner at the front of the stand which obviously I couldn’t see, but seems to have read “Free Freddy” from what I saw on Instagram after the game. 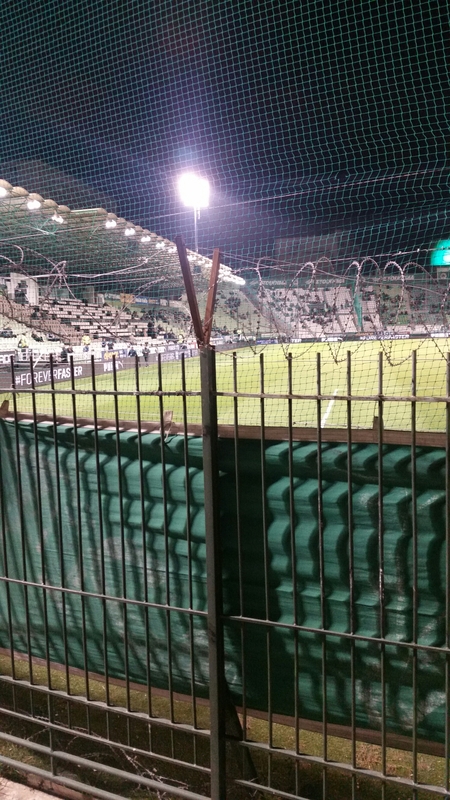 There was a terrific atmosphere from both sides of the stadium as the game kicked off, with three capos at the front of the away end leading the chants, and many of the ultras sat on the fence that divided the pitch from the supporters. I’ve always thought of Eintracht Frankfurt as being different to the usual German team, and the people who made up the away end were proof of that. Many German away ends would be full of people with 12 scarves tied around their arms, wearing a denim jacket with lots of patches sewn into the back, but this wasn’t like that. Eintracht Frankfurt feels like a club for the underdog, one where everyone is welcome. From the usual young guys in black North Face jackets to those with tattoos on their necks or a ring through their nose, it didn’t matter as long as you were SGE. The song book was also a lot more varied than “SHA LA LA LA LA LA LA LA (team name)” which you hear at some grounds, putting together a very impressive atmosphere. Despite the palpable undercurrent of rage you could feel in the away section, they remained very supportive of their side, urging them forward. 25 minutes or so into the game, the support would be rewarded with a goal, Alexander Meier finding the back of the net and sending the away end into raptures. Despite the fact that everyone was going bonkers, you didn’t see anyone falling over or causing injury to themselves like I have done so many times in an away end with seats, further proof if it was needed that terracing simply must be an option which is available to football supporters. The away end linked arms and bounced up and down to celebrate the opening goal, as well as one of the many football chants that is now firmly stuck in my head for the rest of my life “Köln, Köln, wir scheißen auf , die Dom”. If you don’t speak German I’ll tell you that “Dom” is the word for cathedral, the rest I’m pretty sure you can work out for yourself. So, would this be the day it all turned around for Eintracht Frankfurt, a glorious away win in Cologne helping the eagles soar towards the top half of the table? Well, no. Barely five minutes had gone by when a terrible error from a defender gave Koln an easy chance from just a couple of yards out, one which was gratefully taken by the attacking player, blasting the ball past the keeper who never had a chance. All the good work undone in an instant, and that would be a theme for SGE throughout the match. Several times their players would pull off a great bit of skill, only to mess up something much easier a moment later. Half time arrived with the score level, and it would be this 15 minute break that would see the kind of organisation that the midfield and defenders could only dream of. “Scheiss DFB” banners were distributed to the entire away end, including people in the top tier hanging their scarves over the edge, with supporters in the lower tier wrapping the flags around their scarf to be pulled back up. They were also rolled into a ball and thrown up, ensuring that everyone had one. As the players came out for the second half, the protest against the DFB banning supporters, preventing tifos from taking place and punishing Eintracht for the use of pyro, among a list of other reasons that was posted in the away end – these were just the ones I could translate from German. The banners were raised aloft, sending a message that was impossible to ignore. Just in case they tried, the chanting could be heard for miles around: “**** THE DFB, EINTRACHT FRANKFURT WILL FIGHT YOU” is the best literal translation I can give, it could also mean “will keep fighting”, but the message is just as clear either way. This went on and on and on, only pausing for the first time when the home side took the lead on roughly the hour mark – more poor defending leading to SGE falling behind. Still the away supporters did not give up hope and did not turn on their team, but you could sense they didn’t believe the 11 men on the field could give them the kind of result and performance their efforts deserved. It was party time in the home end meanwhile, with the home terrace bouncing up and down as if they were doing their best to cause an earthquake. While the focus of my story is on the away side, credit really must also go to Koln, it’s one of the best German stadiums I have visited and certainly somewhere I would recommend for lovers of football culture everywhere (ok, maybe not in Gladbach, but most places). Not too long after the second goal for Cologne, the third one arrived. Frustrations had already boiled over on the pitch a few minutes before, three players being shown a yellow card after some prolonged pushing and shoving that probably should have also seen at least one red. With their side now 3 – 1 down and the rest of the stadium a sea of twirling red and white scarves, the full fury of Frankfurt was unleashed. Many supporters climbed the fences of the away end to encourage those in the home end to see them outside, and probably not to swap scarves and chat about the game. The capos at the front of the stand were screaming into the microphones to keep going and keep supporting the team until the end “Give them everything you have for the last ten minutes”. So they did. Until the bitter end they kept singing and supporting their team with proud and defiant chanting. Again my translation is not perfect, but the final chant was something like “The first love, the one that lasts forever, Eintracht Frankfurt my team”. After ensuring that their team had been supported for 90 minutes, the supporters stopped holding back once the full time whistle blew. As the players reluctantly made their way over to the away section, many of the ultras scaled the fence to launch furious verbal abuse at them for their failure and perceived lack of effort. 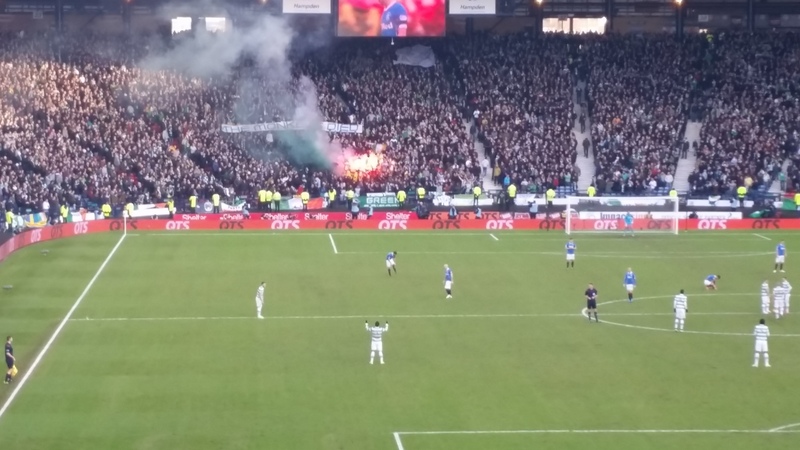 As an additional method to show their fury, a bonfire was started at the front of the away end, with the protest flags from earlier being set ablaze. 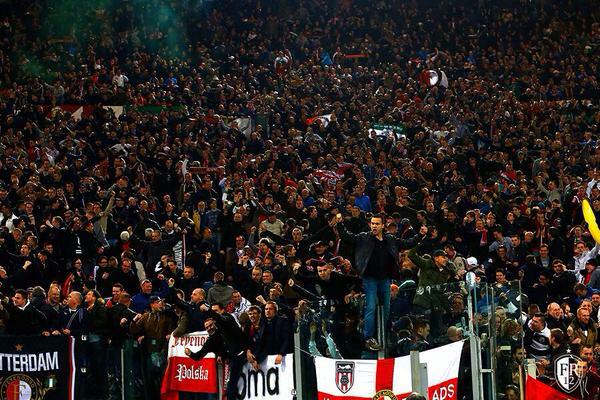 Anyone who regularly follows a team away that isn’t Barcelona or Bayern Munich has probably been angry enough to want to set the odd away end on fire after a game (you should have seen me in 2009 at Sheffield Wednesday), so I have to give credit to SGE for actually doing it! All in all this was probably the angriest away end I have ever been in, and I fear that it is only going to get worse over the coming weeks for the Frankfurt side. There was not much to suggest that the players have the fight for a relegation battle. One thing is clear – it would be a football culture tragedy to lose this club from the Bundesliga, especially if they are to be replaced by the latest vile Red Bull marketing project in Leipzig. For some perspective, my ticket cost 15 Euro, I could stand up, nobody tried to sell me a half and half scarf and no stewards rushed to stop any signs of protest – the DFB hasn’t allowed things to get as bad as it is in England just yet. But they certainly need clubs like Eintracht Frankfurt more than Eintracht Frankfurt needs them, and if they enter a war, it might just be one they cannot win.